Camping Fee: $25 per adult (age 19 and over) for the weekend. 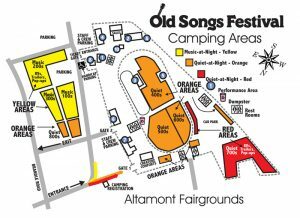 Camping at the Old Songs Festival has been designed to meet Albany County Public Health Campground Code. (inside the OVAL), QUIET-AT-NIGHT for tents, vans, pop-ups. We recommend this area for families with children under age 12. Cars parked in this area cannot be moved during the festival. If you need to move your car during the festival you must park it in the Car Park area. Includes sections 400, 500 and 600. QUIET-AT-NIGHT: 700 section for RVs, Travel Trailers, Vans and Pop-Ups. We cannot guarantee hook-ups in this area. MUSIC-AT-NIGHT: Music at night 200 for trailers & RV’s, 100 & 300 for tents, vans, pop-ups and YELLOW area Overflow (800) which should be fairly quiet. Please indicate what kind of equipment you have. We cannot guarantee hook-ups in this area. Note two different sites, Red and Yellow. If you’d like to be in the same location you have been assigned to before, we will try to accommodate you. You must come to the festival with full water tanks and empty sewage and gray water tanks. You can dump at Thompson’s Lake State Campground, 6 1/2 miles on Route 156 for the $7 entrance fee, 7 am–9 pm. ON-SITE CAMPING: Camping locations will be assigned at random on a first come, first served basis. The camping area is divided into 30′ squares separated by a 10′ open space. Each 30’ square is numbered and divided in half. Example: Site #20A and Site #20B. Expect to be sharing the square with another party. Your camping equipment must fit within half of the square. If your car won’t fit, move it to the car park. Remember, each camping site (not RV) is a 30′ x 30′ square. CAMPING is available for purchasers of an All-Festival Ticket. Includes any of the following nights: Thursday, Friday, Saturday, Sunday. All camping squares are numbered and reserved. 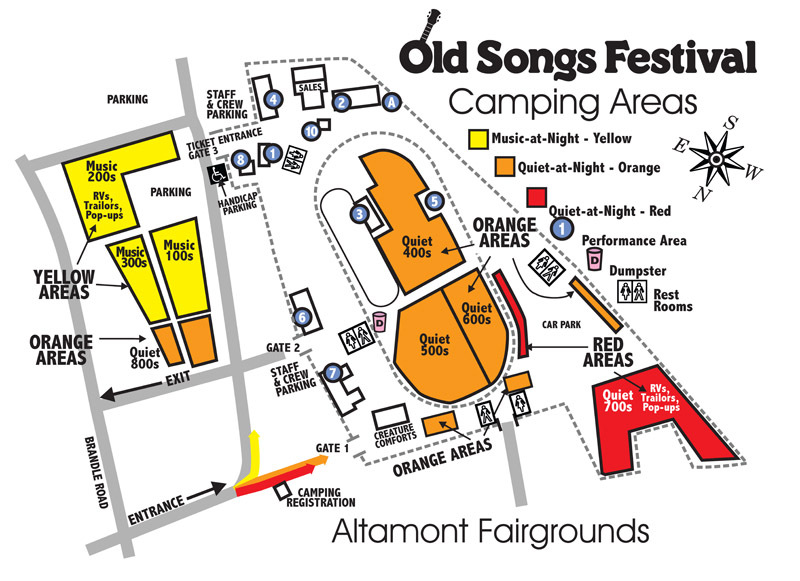 CAMPING is divided into the ORANGE, RED and YELLOW areas (see at left for description). All camping is “dry” camping meaning there is no service available on individual squares. PLEASE NOTE: There is one family or 2 individuals on a SITE. The 200 & 700 areas designated for RV’s & Trailers are assigned one SQUARE. Your equipment must fit inside the SITE 15’ X 30’, OR SQUARE 30’ X 30’. GROUPS wishing to camp together must send in ticket orders in the same envelope. Each individual order in the group must be written separately. In general, all camp locations are in close proximity to potable water and restrooms or porta-johns. Be sure to bring a GALLON OF DRINKING WATER, so you can refill it at a water spigot. Charges for electricity have increased substantially, making it necessary for us to collect an additional fee if you plug in to any electrical outlet at the fairgrounds. Use outdoor-rated extension cord and no-fault circuit interruptor. The fee is $20 per extension cord, payable with your ticket order. All receptacles do not necessarily work, however, in which case we will refund your $20. Camping Rules: The open space between camping squares must remain unobstructed. No open fires or charcoal stoves. Propane stoves and lanterns are permitted, but must not be left unattended. No pets are allowed except service animals. PLEASE NOTE: Space will be limited and we reserve the right to close on-site camping when we are full. We recommend early registration.